What happens to “local” sound when globalization exposes musicians and audiences to cultural influences from around the world? Jeremy Wallach explores this question as it plays out in the eclectic, evolving world of Indonesian music after the fall of the repressive Soeharto regime. Against the backdrop of Indonesia’s fitful, chaotic transition to democracy, Wallach takes us to recording studios, music stores, concert venues, university campuses, video shoots, and urban neighborhoods. 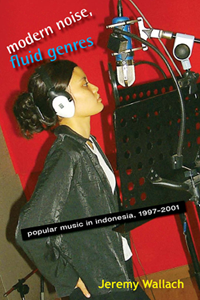 Integrating detailed, ground-level ethnographic research with insights drawn from contemporary cultural theory, he shows that Indonesia’s access to globally circulating music and technologies has neither extinguished nor homogenized local music-making in Indonesia. Instead, it has provided young Indonesians with creative possibilities for exploring their identity in a culturally diverse nation undergoing dramatic changes in an increasingly interconnected world. Veit Erlmann, University of Texas, Austin, author of Reason and Resonance: A History of Modern Aurality and Music, Modernity, and the Global Imagination: South Africa and the West. Timothy D. Taylor, University of California, Los Angeles, author of Global Pop: World Music, World Markets and Beyond Exotica: Western Music and the World. René T. A. Lysloff, University of California, Riverside, co-editor, Music and Technoculture. Ariel Heryanto, Australian National University, author of State Terrorism and Political Identity in Indonesia and editor of Popular Culture in Indonesia: Fluid Identities in Post-Authoritarian Politics.